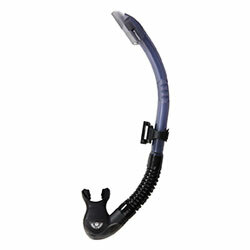 This portable skin diving snorkel is made entirely of soft silicon with superior shape-memory characteristics, allowing it to be rolled up in the special carrying case for use as a spare. Minimizes water resistance with a 3D elliptical structure. Classic and simple J-type design.